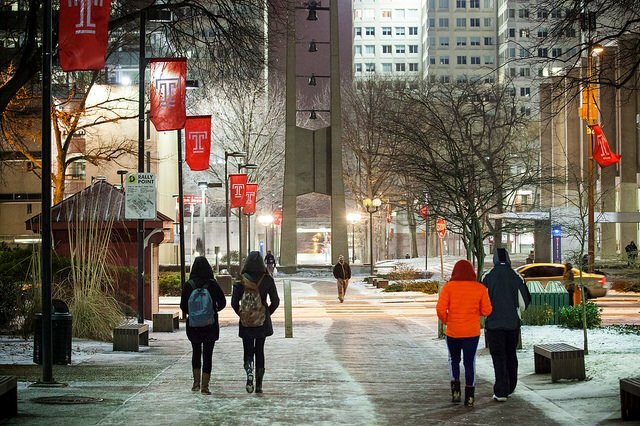 The Princeton Review and Entrepreneur magazine recently released its list of top schools for entrepreneurship studies for 2017 and Temple Unversity snagged a coveted spot. The ranking earned the school some bragging rights, too – no other Philadelphia university placed on the list. The list, published Tuesday, broke down the schools by the top 25 undergraduate schools and graduate schools for entrepreneurship studies. Temple placed as the No. 8 spot on the undergraduate list and No. 9 on the graduate list for its Fox School of Business and Management programs. The Princeton Review considered more than 300 schools and conducted a 60-question survey between May and August that looked for the schools' commitment levels to the major to find the rankings. The admission services company also paid special attention to percentage of faculty and students involved in entrepreneurship endeavors, availability of scholarships related to the major, level of support for business plan competitions and more. Thirty-five schools made the complete list. "It's exciting that schools across the country are embracing entrepreneurism, exploring and developing new ways to promote it, and preparing their students for an ever-changing economy that's full of opportunities," said Jason Feifer, editor-in-chief of Entrepreneur magazine in a news release. "And it'll be even more exciting to see what these students do next." Babson College in Massachusetts came in at No. 1 on the undergraduate list while Harvard University took the No. 1 spot for the best graduate school for entrepreneurship programs.